I've saw this on Facebook and loved it. So, went out to try it. I suspect it will end up costing me £15 rather than my proposed fiver. But if you read this post to the end, you'll learn from my mistakes, save yourself a tenner, and have something great for your play room for a fiver. That's right, I know it, you're sold. Did I mention my lack of creativity? 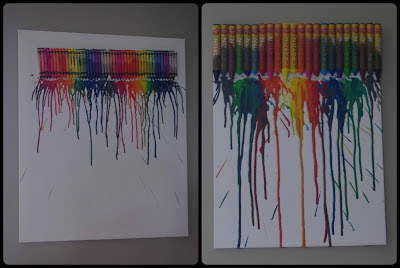 I love the idea of crayon art. I saw a crayon table and chairs once, which I loved. And this just seemed even better. I prefer take two- but it's still not perfect. So I suspect they'll be a take three. It was so simple, not only did it cost less than a fiver but it only took 15 minutes. 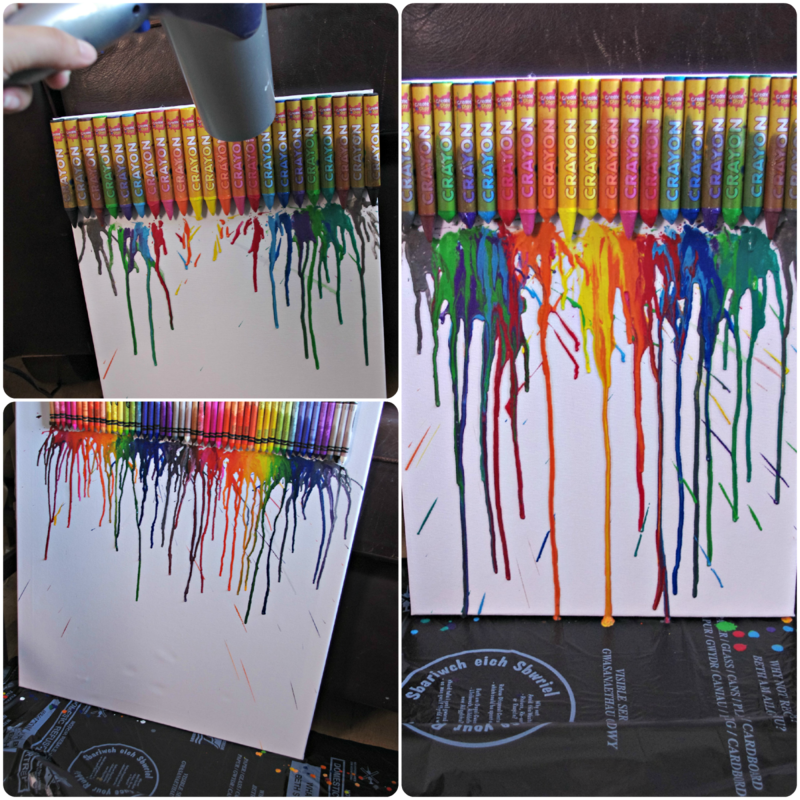 For the first attempt we bought a big cheap canvas from Home Bargains, Crayola crayons, and we used our glue gun and a hair dryer. Conclusion: position the crayons in line with the canvas rather than try to glue in a straight line, and use a smaller canvas. For the second attempt we used a smaller canvas and cheap thicker crayons. It worked so much better working across the top of the canvas, it worked much better on a smaller canvas, and it worked with thicker crayons, but as they were cheap some of them refused to melt with the hairdryer. 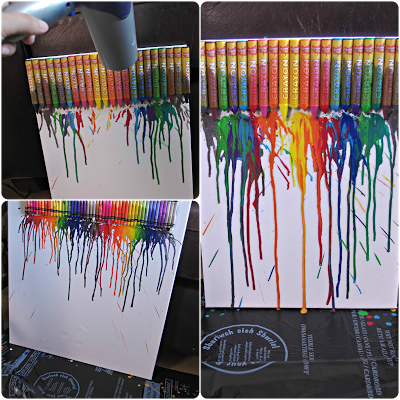 Conclusion: we will have crayon art. 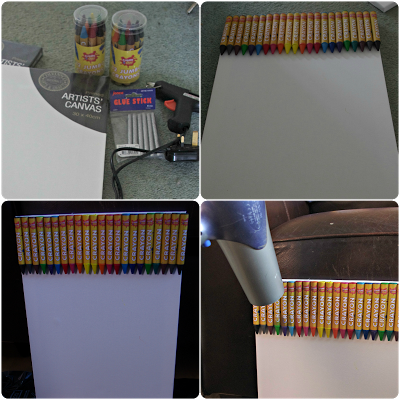 It will be on a small canvas with crayola crayons positioned across the top of the canvas. Now I've figured out what I'm doing Squeaks will be in charge of the hairdryer. And it will be fantastic. And it is possible for a fiver. Look out for our perfect art work in the background of future piccies! I love this, it's such a clever idea! Thank you :) I love discovering so many ideas to try out. This is ace, I want to have a go! And even better for me- even with no creative flair I managed it and the children love it! We did this with pumpkins last year, so much fun! 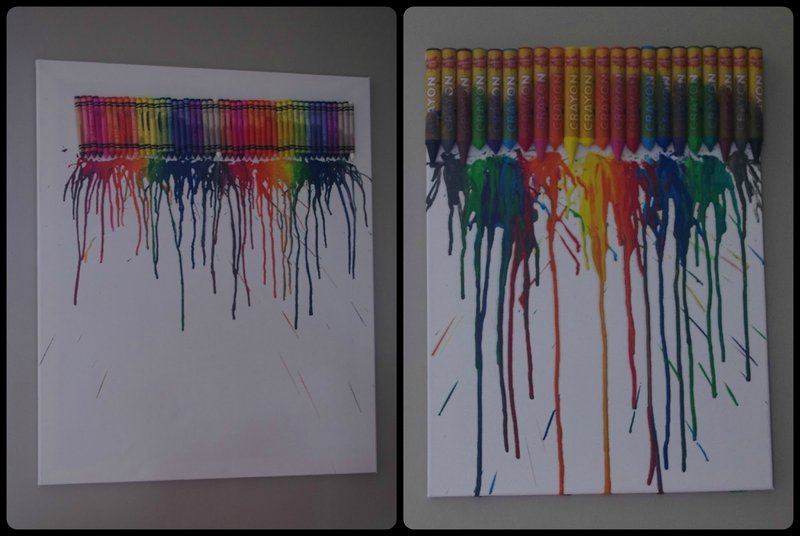 I was shocked how fast the crayons melted! Pumpkins- wow that would be fab! And yes on the crayons melting I wondered how long I would be waiting but I reckon it was done in five minutes.